WRAP and Peer Support = Recovery with No Limits! WRAP has been a Peer Support initiative from its beginning. The WRAP and Peer Support Handbook, which is available to pre-order NOW, is a compilation of information on WRAP and on Peer Support. Through using these two strategies, which many people think are the gold standard for recovery, wellness and well being, you can achieve expanded recovery possibilities. Recovery has no limits. The reason I wrote this book is to make Peer Support used with WRAP, easily understandable, accessible and useful to anyone who wants to integrate those strategies into their lives. I believe that those who choose to use WRAP and Peer Support will find (as I have) that these strategies enhance the quality of every aspect of their lives. Because I use WRAP and Peer Support in my own life, I experience more moments of well being, happiness and, in short, pure joy from the gift of being alive. 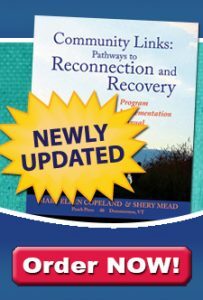 My previous book, Wellness Recovery Action Plan and Peer Support that I wrote in 2004 (Dummerston, VT: Peach Press) with Shery Mead was excellent. Many, many people liked it and found that it supported both their personal wellness and their support of others. Even though it was not so long ago, that was the early days for recognition of the value of Peer Support. WRAP itself was only 7 years old. In the intervening years we have all learned so much about WRAP, about Peer Support, and about how they can and do work so successfully together – each enhancing the other. In addition, because of the rapid growth of the internet in that time, we have become much more capable of easily gathering information – sometimes daily – from those people who know the most about WRAP and about Peer Support, those people who use it every day to give support to others, to get well, to stay well and to make their lives the way they want them to be. 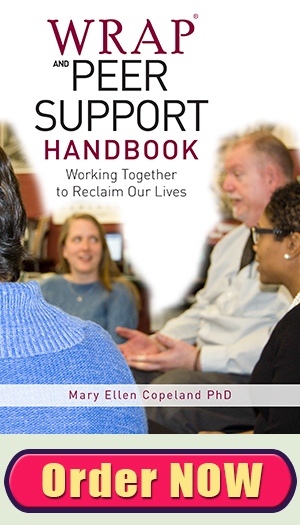 This new book, the WRAP and Peer Support Handbook, is a reflection of all that I have learned from people who use WRAP and Peer Support in their own lives. It includes many actual role plays and real life examples. WRAP and Peer Support is not about being given answers, but rather about finding answers that work for each of us as individuals. Therefore, this book contains many, many discussion topics, suggestions for role plays, and even walks you step-by-step through the process of developing a WRAP using Peer Support strategies – either with another person or people, or in a facilitated WRAP group. It also contains ideas I gathered through a Facebook query on how people use technology for Peer Support. I believe the ideas, strategies, and the values and ethics shared in this book have broad applicability in every aspect of our lives, and in all the world situations that cause us grave concern. The world would be an easier place to live if everyone incorporated WRAP and Peer Support into their lives. Try using WRAP & Peer Support in your life to find more moments of happiness and to discover the joy in being alive.